Bill Russell, the greatest of all Boston Celtics, bent forward to unveil a bronze statue of himself on wind-blown City Hall Plaza Friday. A slight tug on a green rope, a step back as a green covering fell, and Russell paused to look at a larger-than-life rendering in sculpted bronze. A champion known for fierce competitiveness, Russell gazed almost sheepishly at this tribute from a city that never fully embraced him as he and the Celtics delivered 11 basketball titles in 13 seasons. But outside a tent that protected Russell and the statue from the nasty weather, about 200 people, many of them startled passersby, started to cheer. “Long overdue!” one man yelled. “Thanks for the championships,” cried another. “We love you, Bill,” added a third. The basketball legend who had long distanced himself from a city that he once considered bigoted, walked a few steps to a metal barrier that separated him from the small crowd. Russell did not say a word, but he smiled and slowly waved his hand. As the cheers grew louder, Russell’s smile grew wider. 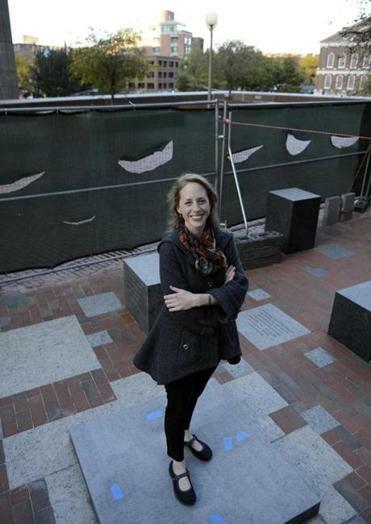 Hirsch, knowing what sports means to Boston, wanted both the honor and the privilege of shaping the statue of the Celtics legend. The interaction was brief, but the emotions seemed heartfelt as the city finally, formally, unveiled a statue to Russell: 600 pounds of bronze that show the former Celtics captain with a basketball grasped in his hands, his legs coiled, and his head cocked upward. 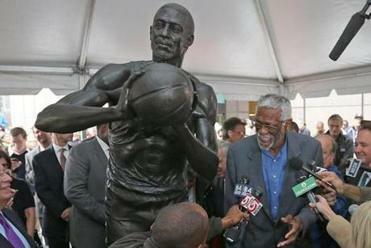 Boston Celtics Hall-of-Famer Bill Russell was surrounded by former teammates and others Friday as his statue was unveiled on City Hall Plaza. But what Russell was lauded for, both at the unveiling and at a celebrity-studded ceremony afterward, was more than the statistics that made him a towering sports figure. Instead, he was honored primarily for his keen activism. Russell, sitting on a dais behind the podium, barely moved as tribute after tribute followed — for his feats on the basketball court, for his humility, and for his lasting commitment to be a voice for the powerless. When Russell spoke, his 6-foot-9 frame still trim in a grey suit, he focused on the values he inherited from his family. The audience was a diverse mix of greats and former teammates from the National Basketball Association, politicians and philanthropists, and figures from academia and the business world. Celtics teammates such as Tommy Heinsohn, Sam Jones, and Thomas “Satch” Sanders attended, as did former stars JoJo White, Elgin Baylor, Julius Erving, Bill Walton, and Charles Barkley, among others. The crowd included Jim Brown, the Hall of Fame running back for the Cleveland Browns; David Axelrod, the former aide to President Obama; and vocalists Johnny Mathis and Bill Withers, who sang a tribute to Russell’s devotion to family. “He was a human being who saw a world that was imperfect but devoted himself to fixing it,” said Bobby Sager, cochairman of the Bill Russell Legacy Project, which developed the plan for the statue. The sculpture is located on the State Street side of City Hall, and the site includes 11 blocks of granite, representing Russell’s 11 professional championships. Each stone features a key word and corresponding quotation from Russell that speak to him as a man, not simply Russell the athlete. The Legacy Project has also established a mentoring grant program that will make annual awards to local nonprofit groups. Russell insisted that the project include a benefit to the community. Walton, a Hall-of-Fame player who helped the Celtics win the 1986 title, called the statue “tragically overdue” in a city that was largely divided by race when Russell, a proudly independent black man, made the Celtics a benchmark for success, even as he made many of the team’s white fans uneasy. The sculpture is the latest in a string of statues erected for local sports heroes, from Ted Williams, Carl Yastrzemski and other Red Sox outside Fenway Park, to the statue of Celtics coach Red Auerbach in Faneuil Hall Marketplace, to the sculpture of Bruins legend Bobby Orr outside TD Garden. Until Friday, the city had not honored Russell in a similar way. Miles Russell said the family is proud of the honor, even though more than four decades have passed since his grandfather’s retirement in 1969.